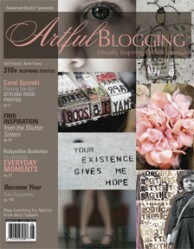 Continue the inspiration with the Autumn09 issue of Artful Blogging. Featuring the online journals and virtual galleries of artists from around the world, this enticing issue is a must-have for new and experienced bloggers alike. Immerse yourself in a journey of self-discovery, creative expression and the growing community of artful bloggers everywhere. Get even more tips on Blogging Etiquette, Bloggers Must-Haves and How to Get Started on your own blog spot!